Kirito jumps into a new VRMMORPG called ALfheim Online (ALO) in search of Asuna, who still hasn't regained consciousness. 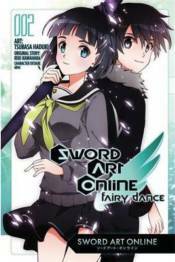 On his quest to find the World Tree and reach Asuna, he meets a sylph girl named Leafa. A veteran player experienced with the sword, Leafa recognizes that Kirito is motivated by serious circumstances and decides to help him. But Leafa's identity in the real world is Suguha Kirigaya - Kirito's sister. And it's the glimmer of her beloved brother she sees in Kirito that prompts her to lend him a hand. Now, despite the conflicting interests guiding them on, the pair set off on a journey to the World Tree! SWORD ART ONLINE ALICE CODE REGISTER EXQ FIGURE SWORD ART ONLINE ALTERNATIVE GGUN GALE ONLINE H LLENN DESERT BULLET VER.